Glasses can go one of two ways - You either look like you just rolled out of bed, or you look like Zooey D's super cute successor. I'm a big fan of the second look, but no so much the first. So, here's how I make sure I'm channeling The Queen of Awkward Cuteness instead of Animal from The Muppets. In order for your eyes to show up behind your glasses, you'll want to play up your eye makeup more than you normally might. For instance, on normal days I just wear eyeliner and a coat of mascara. 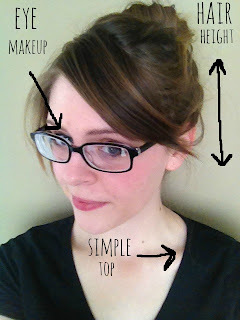 If I'm wearing my glasses, I'll do a fast smokey eye (tutorial here) and put on more mascara to make sure that the glasses are an accessory for my eyes, not the other way around. If you're wearing glasses when you normally don't, it's going to be what people focus on, since what they look at first is your face anyway (and if they're looking elsewhere first, you probably don't want to hang out with them in the first place.) When I wear glasses, I keep it simple everywhere else - trouser jeans, strappy sandals and a v-neck are a fav, and booties with shorts and a flowy solid top are a good bet in warmer weather. I love wearing my glasses, especially when involved giving a presentation or some other academic pursuit :) HAHAHAH naysayers! Sweet poetic justice, how the tables have turned... now the bullies who made fun of your vision-related shortcomings are buying fake glasses at Claire's. These are really great tips. I don't need glasses, so I've only started wearing them (non-perscription ones) in the last year, but I'm really loving it. I hadn't really though about the facial width thing at all before, but it makes a lot of sense. I saw your post at IFB! 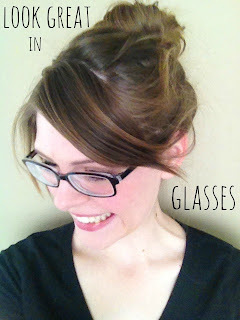 Isn't it great that eyeglasses have become such a hot fashion accessory? Congratulations on being featured in IFB's Links a la Mode this week.